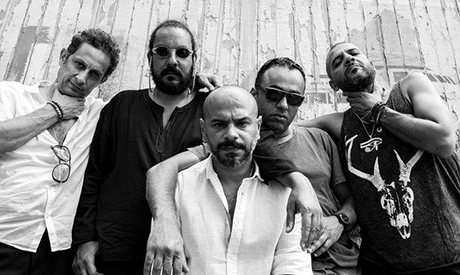 Egyptian band Massar Egbari have released their anticipated album 'El-Album' on Thursday after weeks of an ad campaign sponsored by a prominent telecom company. "Congratulations for you and us, most beautiful fans. We walked together in the journey of [making] this album. It was a long process [because we wanted] to please you with good songs you would like and we continue our road together with it. Thanks for your support all the way," Massar Egbari wrote on their official Facebook page. With all its music videos directed by Taimour Taimour, El-Album, which comes out three years after their latest 'Tou’aa w Te’oum', features collaborations with many other well-known artists including MTM, Sary Hany, Mohamed Sakr, Amir Hedayah, Shergo Mikawi, Hesham Galal and Ahmed Saleh. Many poets wrote the lyrics in 'El-Album,' including Amaar Mostafa, Mohamed Ibrahim, Doaa Abdel-Wahab, Mamduh Fawzy, and Hazem Gamal. The band was founded in 2005 by members Ayman Massoud (keyboards), Hani El-Dakkak (guitar and lead vocal), Ahmed Hafez (bass guitar) and Tamer Attallah (drums), before Mahmoud Siam (guitar) joined in 2008. Massar Egbari – as written in their bio – plays a form of alternative Egyptian music, mixing rock, jazz and blues with some Oriental music. The band is developing regional and international fame. The band will perform in two successive concerts at Bibliotheca Alexandrina's Arts Centre on 7 December. Both concerts have been sold out in advance, according to the band.